Danziger has a wide range of varieties and end-consumer brands. “We believe that innovation is more than developing extraordinary products; it’s about delivering the best value to our customers - from excellent service, agile business methods and newest production techniques to compelling marketing”, says Ori Danziger, Deputy CEO. Lia is part of the rich, renewed and innovative Calibrachoa assortment Danziger bred composed with other series that fit both growers and end-consumers needs. The Lia series was bred for 12 cm pots and baskets and is composed of a range of vibrant colors, and this year with the new additions of Lia Dark Red and Lia Glaze, a pure white variety. Amore - a Petunia series with a total branded experience. The success of Amore is due to a perfect combination between top of the line breeding and good storytelling for the end-consumer, benefiting both the grower and the consumer. Timeless collection - a new innovative generation of Bidens that was introduced last year and symbolizes the bridge between the past and the future. This year at Essen the breeder will introduce more varieties which are not only yellow. Red Band and Blazing Fire add bright red and orange colors to the collection. In addition to the bedding plant display, Danziger will also exhibit their cut flowers' best sellers. In this section, visitors will be able to explore the new Million Clouds, a small full flower gyp (this variety will be also launched under the brand Cloud - which is grown by an exclusive group of professional growers in Ecuador, IGNAZIA; Danziger will support both brands), completing the range of possibilities alongside the Xlence variety with XL flowers and My White Cosmic, which redefines the color white. 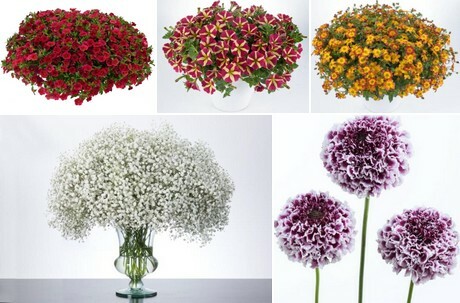 The brand Scabioa Scoop in a wide choice of colors, textures and many more options for uses and inspiration for growers and buyers, presenting also Focal Scoop, a new product in the world of flowers, positioning the Focal Scoop varieties as part of the focal flower options designers and buyers have. “We believe that the IPM Essen is always a good opportunity to meet our customers and introduce them to our unique novelties in both; bedding plants and cut flowers. Our team is looking forward to meeting our customers at our stand, Hall 2 D.40”, says Ori Danziger.